The island has no cell phone service, spotty internet access, and a single grocery store. It has fewer than 800 permanent residents, one of whom is the ghost of Blackbeard. A favorite entertainment option is attending a discussion at the history museum where a panel of octogenarian residents named Blanche and Bertha and Earl talk about how wonderful the island was before it was corrupted by modern amenities. There’s only one flaw: you can’t buy a pizza pan on the entire island. Normally this would not be a problem. But when it’s the birthday of a young prince and he’s issued a dinner decree – pizza, homemade -- it becomes a matter of some importance. We rummaged in the cabinets of the house where we’re staying. The result? One slightly-dented cookie sheet. We pedaled over to the grocery store. Since we were not in need of poker chips or Funyuns or any of 20 varieties of mosquito repellent, it was an unsuccessful quest. The two “gourmet” boutiques on the island offered microbrews, mesclun greens, and champagne mustard, but few choices of cookware. The hardware store stocked a full range of wire nuts and spackle but no baking pans. 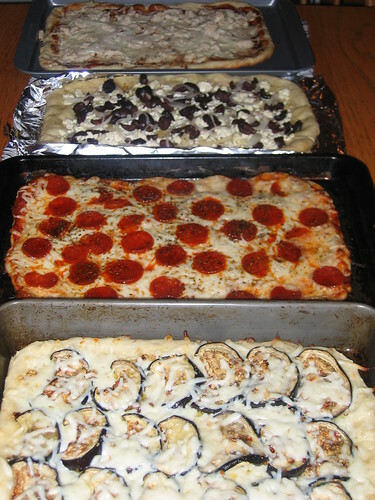 The four pizza pies ended up rectangular in shape. The toppings were somewhat irregular in composition. But the results were uniformly delicious: chunks of tender chicken on a smear of barbecue sauce, a classic pepperoni and mozzarella with red sauce, a Greek-infused kalamata olive and feta concoction, and a garlicky eggplant sprinkled with hot red peppers and parmesan. All on a light-but-toothsome homemade pizza crust. The prince was satisfied. And not just with the pizza. The crowning glory of his birthday celebration involved I-24, his winning bingo number at the volunteer fire department’s weekly extravaganza. Sometimes the Dingbatters get lucky. Mix together all ingredients and knead – by hand or with a mixer – until the dough is smooth. This doesn’t take long. Put dough in oiled bowl, cover, and let rise for 45 minutes. Then, refrigerate the dough for at least 4 hours – or up to 36 hours – to develop the crust’s flavor. Divide the dough in half. Heat oven to 500 degrees. Press the dough into a pizza pan, cookie sheet, or whatever the hell you need to use. When oven is at correct temperature, place pizza on middle rack for 5 minutes. Remove from oven and cover with your favorite toppings. Return to lowest rack of oven and back for an additional 8 minutes, or until the crust is golden brown and the filling is bubbly. This recipe makes two pizzas. You can easily double or even triple the quantities. To make the pizzas in the photos: 1) Spread prepared barbecue sauce to cover dough. Add chunks of cooked chicken and thinly sliced onions. Cover with mozzarella. 2) Spread prepared pasta or pizza sauce to cover dough. 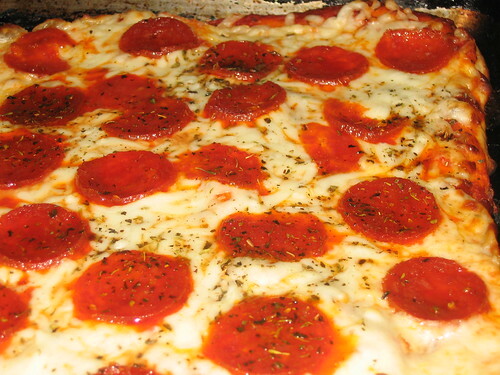 Sprinkle with sliced pepperoni and cover thickly with mozzarella. 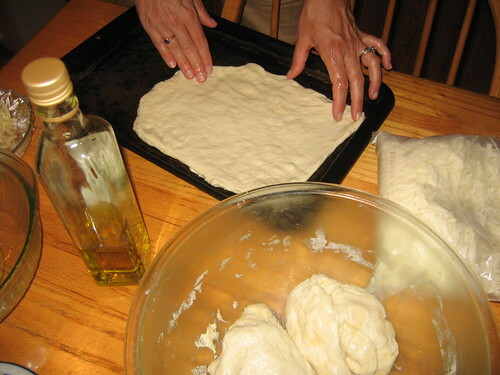 3) Brush olive oil over surface of dough. 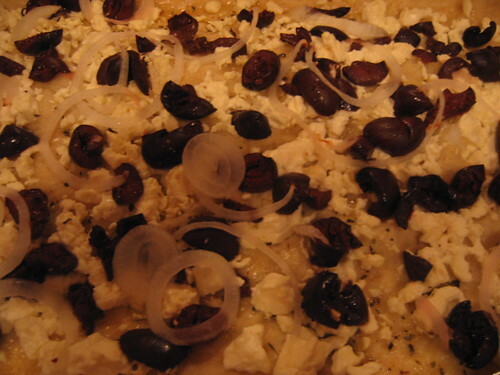 Cover with nubbins of feta cheese and pitted Kalamata olives. Add thinly sliced onions and sprinkle with oregano. 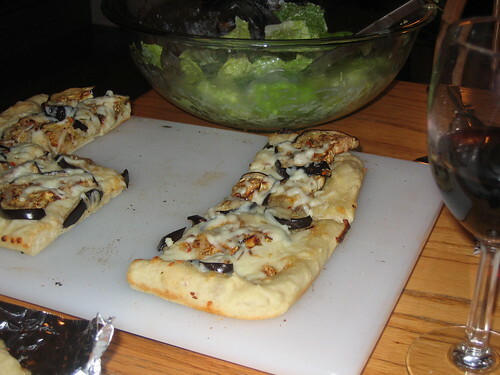 4) Before making pizzas, cut eggplant into thick slices and then halves. 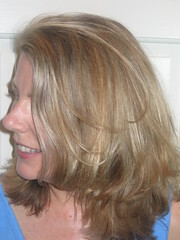 Lightly brush with olive oil and broil a few minutes on each side. 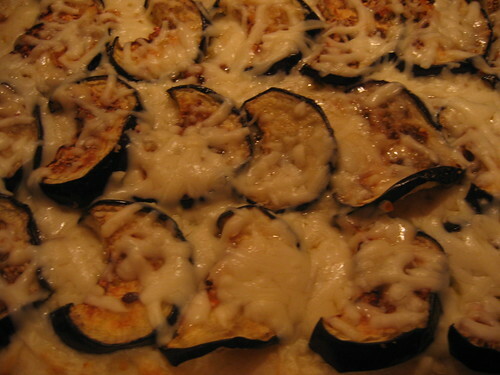 Brush olive oil on crust, cover with eggplant halves. Heat 2 T. olive oil in small pan. Add 2 cloves chopped garlic and ½ t. dried red pepper flakes. Heat 30 seconds and spread mixture over eggplant. Sprinkle pizza with half Parmesan and half mozzarella cheeses. can a lady-in-waiting get a taste of both pissaladiere AND the pizza pie? The Queen even posts while on holiday? This has to be the most consistent blog I've ever had the pleasure of frequenting. 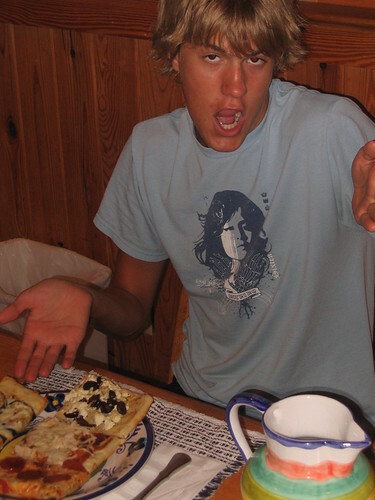 Am I the only one who had to Google "pissaladiere"? Ummmm.... is that bottle in the first picture olive oil or tequila? And if the latter, please elaborate on the pizza recipe in which it is used. Markb, The Queen appreciates your appreciation. Currydude, I think a Margarita Pie is a distinct possibility. Hold the worm.